The Trump administration is soliciting a contractor to hire more than 16,000 new Immigration and Customs Enforcement employees, about half of whom will serve as deportation officers to fulfill the president’s mandated hiring. ICE will pay the consultant a flat rate for each new employee it helps the agency hire, according to the solicitation. The vendor will receive 80 percent of that rate when an applicant receives an official offer letter, and the remaining 20 percent on the employee’s first day on the job. 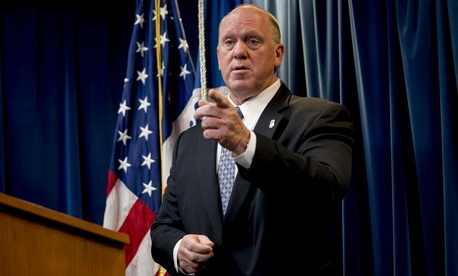 As President Trump called for in a January executive order, the contractor will assist ICE in hiring 10,000 law enforcement agents, including 8,500 deportation officers and 1,500 criminal investigators. It will also assist in the recruiting and onboarding of about 6,600 support staff positions. The solicitation did not estimate the value of the contract, which would consist of one base year and the government’s option for two additional years. Customs and Border Protection recently awarded a similar contract to provide Accenture Federal Services up to $297 million to help it hire as many as 7,500 employees, which will enable the agency to meet another part of Trump order. If ICE spends the same amount per employee, the contract would be worth about $657 million. The payment structure could force some vendors to think twice about bidding for the contract, as its recipient would have to put in months of work for each candidate before receiving any payout. During the request for information process, one interested party noted such a structure would require a company to work for an average of six months without being able to submit any invoices. ICE is expecting the contractor to keep the agency constantly updated. For example, the vendor will have to notify the agency within 24 hours when any candidate is removed from consideration for any reason. ICE noted it expects to receive direct hire authority for many of the support positions, which would negate the use of assessments. The agency said Trump’s required hiring surge is beyond the capacity of its internal human resources office, necessitating the private sector enlistment. The initial RFI from ICE projected the contract would ask for support in onboarding 26,000 employees over the course of five years, but the agency has decided to limit that in scope. 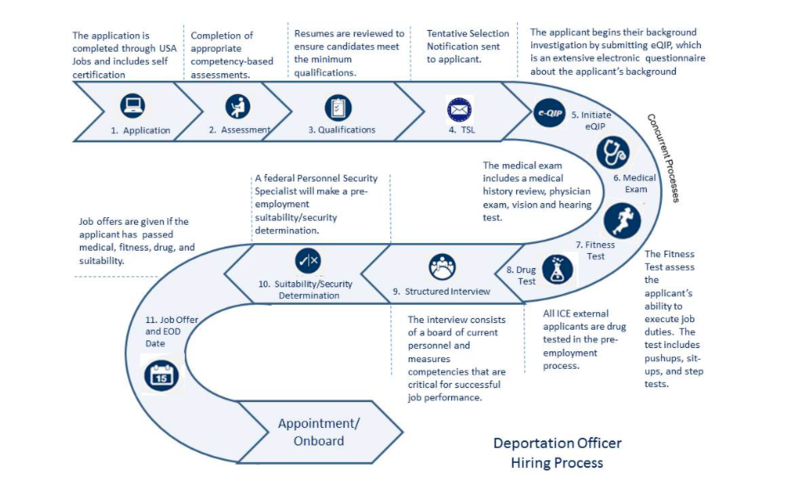 Danielle Bennett, an ICE spokeswoman, said when the RFI was released that ICE has received authority to use direct hiring and dual compensation waivers, and has made general improvements to its hiring processes. These changes, Bennett said, will allow ICE to "meet the anticipated unprecedented hiring numbers in the coming years." The previously announced contract at CBP has drawn some scrutiny. Sen. Claire McCaskill, D-Mo., the top Democrat on the Senate Homeland Security and Governmental Affairs Committee, wrote a letter in January to the agency asking why it could not handle the hiring internally, how it justified the cost estimates and why it obligated the funds to Accenture before Congress appropriated money for the hiring. ICE currently employs just 20,000 total staff. Trump’s mandated hiring surge is slated to take place entirely within ICE’s Enforcement and Removal Operations, while the RFI would boost hiring both at that office and the support staff for the new enforcement agents. Agency officials said in a recent recap of the agency's fiscal 2017 actions that it was making positive progress on fulfilling Trump’s hiring order. In September, the House approved a fiscal 2018 spending bill that would provide $186.5 million for ICE to boost its ranks by 1,000 agents. A Senate appropriations bill did not provide funding for any new ICE agents. “Passback” guidance from the White House’s Office of Management and Budget sent as part of the fiscal 2019 budget process that leaked to Senate Democrats in December required DHS to onboard 2,000 ICE agents in the fiscal year, despite DHS’ suggestion it hire just 1,000.